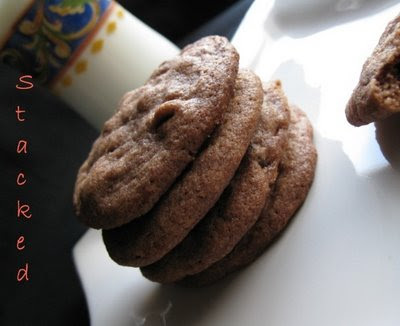 A mouthful to say and definitely worth it, 'cause these cookies are as tasty as they sound. 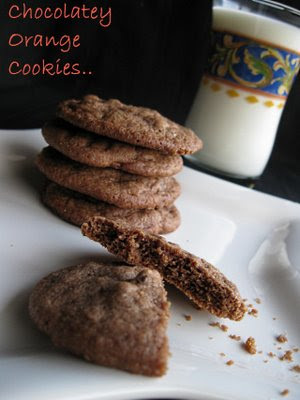 It's that time of the year again, to bring out those cookie recipes and get baking in the kitchen. The joy of baking and the even better one of sharing these baked goodies with friends and family...a feeling of warmth and happiness. Chocolate and Orange is a combination made by the food gods, a combination so exquisite that you just can't get enough of it! In a large bowl, beat butter till its light and fluffy. Add sugar, orange peel and the egg. Beat on medium speed till combined.Add the flour, cocoa, salt, baking powder and baking soda. Combine to form a stiff dough. Now add the orange juice and mix to combine. Stir in the chocolate chips. The dough will be sticky. With the help of a spoon, place small mounds of dough on an ungreased cookie sheet. Flatten to about 1/2-inch thickness with the help of a fork. Bake 9 to 11 minutes or until sides are firm. Cool for a couple of minutes on the sheet and then cool completely on wire racks. Store in air tight containers.I had to really hold myself back from eating all these cookies! Delicious to the last crumb. The Orange juice make these cookies more 'orangey', so if you are not a big fan of orange flavoured stuff, feel free to cut back on the quantity or leave it out altogether. These cookies are off to Eat Christmas Cookies 2 event over at Food Blogga. Don't forget to check cookies from all over the world -- here. Those cookies look great Namratha...and I am a great fan of the choco-orange combo. Here i bought last week i have no idea what to call them, here it was written orange gallet. It is like chocolate chip, but then ornage colour and it taste beautiful. Oooooo, can just imagine how good the cookies can be, for they are two of my favorite flavors orange and chocolate together! Orange and chocolate is one my favorite combos, awesome job! Thanks Happy, oh wow...sounds interesting!! With orange juice and zest these must be wonderfully fragrant and delicious. What a truly special chocolate chip cookie! Thank you! I'm always surprised how good orange and chocolate taste together... the cookies must taste delicious! cookies look crunchy and yummy. I love chocolate with fruity flavors and the photos have come out so good Namratha! I had the greatest pleasure of eating these cookies.. it was the best baked cookies I had ever eaten .. i liked the box offff cookies, Nami!!! chocolate and orange are totally made for each other, the cookies must have been so delicious and gorgeous smelling! Both chocolate n orange goes awesome together...gorgeous cookies.. These cookies were perfect namrus. real chocorangy. wonderful recipe.